Dental implants are put into place to hold a replacement tooth or crown and are offered as an alternate method to dentures or bridges for candidates who are in overall good health and who have a good oral standing. The initial first month following the dental implant will be a healing process in which the implant is still integrating itself into the surrounding tissue and bone. During time period is of vital importance that the patient practice proper oral hygiene and further follow a distinct of care instructions in order to avoid contaminating or irritating the implant site. Keep reading for a list of important, easy to follow care instructions to be followed post dental implant surgery. • Most importantly for the first 24 hours following the surgery, avoid touching the surgical site. Also avoid spitting or rinsing as such will disturb and further irritate the site causing unnecessary pain, bleeding and inflammation. • It is to be expected that during the first 24 hours the surgical site of the dental implant will bleed. The patient should keep clean and sterile gauze pad on the wound, biting down for pressure, in order to clot the site. • Continuing to practice proper oral hygiene over the first month (and on) is essential to the healing of a healthy implant. Continue to brush and floss as normal taking care not to do either around the implant, as well as being careful to avoid sutures. Rinsing daily with the antibiotic salt rinse provided to you will in itself clean and prevent infection of the surgical site. • Experts recommend that patients who have undergone dental implant surgery quit smoking. If not entirely, than at least for a minimal two week period following their surgery as smoking significantly increases the risk for improper healing as well as infection. • Most importantly finish all antibiotic medication provided to you in its entirety to prevent infection! 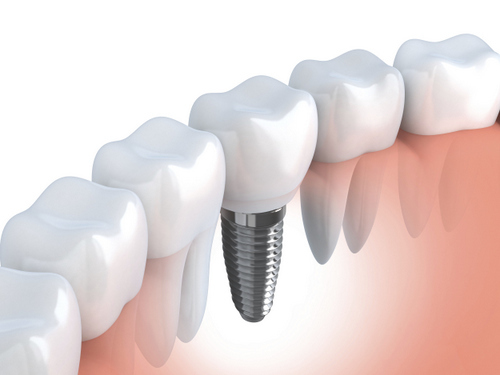 The healing process after dental implant surgery is a very important time for the patient. During this time the importance of proper oral hygiene cannot be stressed enough as such is the only way to guarantee a solid fusing of the implant into the jawbone. Without such a successful fuse the dental implant may not be well-suited to last you a lifetime. So take care of it early on and it will continue to take care of you for years to come! Please contact us if you have any questions about dental implant surgery.